Chorsolisten der Komischen Oper, Berlin, Orchester der Komischen Oper, Berlin / Daniel Huppert. Komische Oper, Berlin, Germany. Saturday, July 9th, 2016. 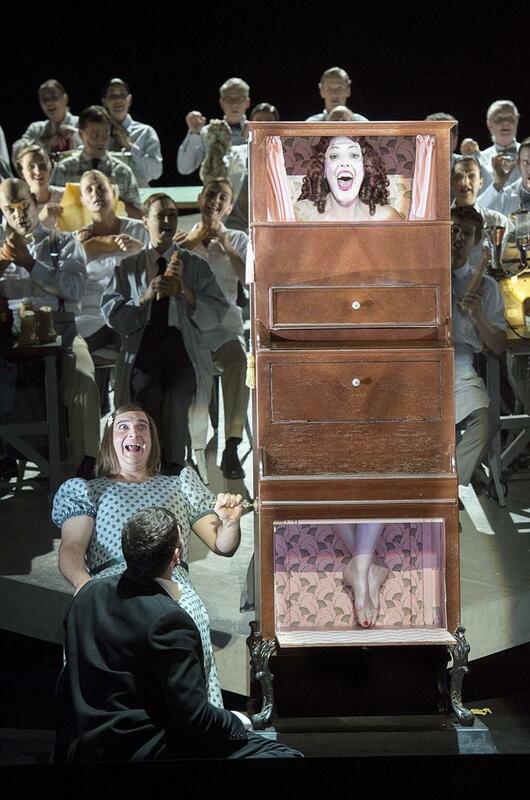 Tonight’s Hoffmann promised to be unlike any seen before. With three people cast in the title role and one singer taking the role of the three principal ladies, this was Hoffmann, in a way, turned on its head. Note that I wrote ‘people’ rather than ‘singers’ cast as Hoffmann because in this performance one Hoffmann, Uwe Schönbeck, was an actor rather than a singer. What Barrie Kosky gave us tonight was a man’s reflection on his life and where things went wrong. Inevitably the score was trimmed but in many ways Kosky actually succeeded in giving us a cogent reading of this epic tale. In an extensive interview in the program book, Kosky mentions that he finds the way that Hoffmann is usually performed a deeply unsympathetic character. 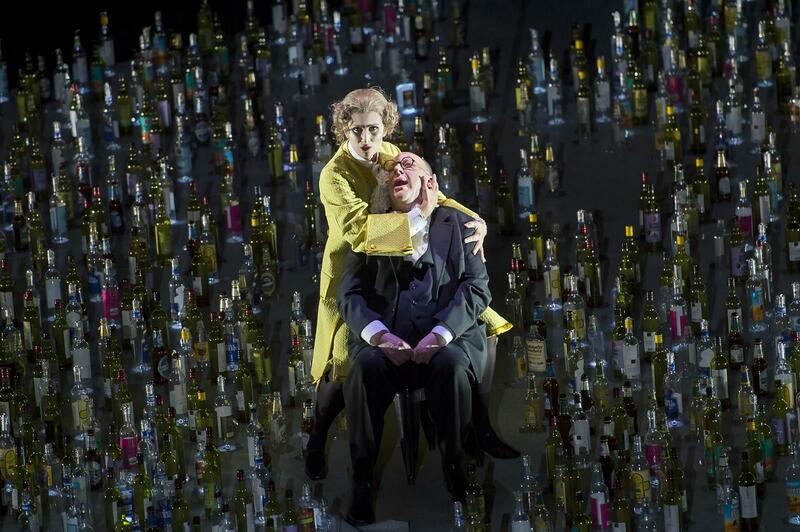 As the curtain goes up, we see Hoffmann 1 surrounded by empty bottles as he muses on his love, Stella, a singer who performed Donna Anna in a production of Don Giovanni – we hear a few measures of the overture at the start and at the end of the evening, as Hoffmann 1 is put in a coffin he ‘sings’ (it was more like Sprechgesang) Zerlina’s lines in ‘la ci darem la mano’ as the Muse sings Giovanni’s up an octave. Throughout the evening, Hoffmann 1 interjects with reflections on the situation of the moment in German while the remainder of the cast sing in French. He also interacts with the other Hoffmanns – Hoffmann 2 who sings in the prologue and the Olympia act and Hofmann 3 who sings in the Antonia and Giulietta acts. 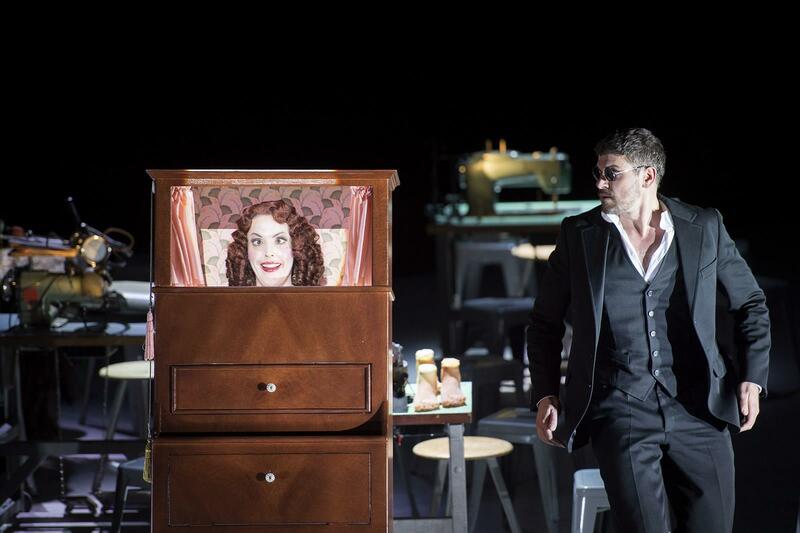 For example, at one point the two Hoffmanns hide behind the wooden box containing Olympia, one emerges and then a moment later the other appears. The epilogue is cut. The idea of having multiple performers incarnating the same character is actually one that works surprisingly well and really helps to give a sense of the journey of the character as he reflects on his past and how it fed into the present. Likewise, having a single singer sing the ladies (and the villains) really brought home the life-long constant nature of Hoffmann’s obsession and the competing forces in his life. Where I felt that things worked less successfully is where Kosky abandoned the music to incorporate the spoken interjections. These held up the musical flow, and while they succeeded in creating a coherent back-story, I felt that they clashed with what was going on around them. There was one other thing that grated towards the end of the Olympia act – Olympia was encased in a wooden box and was spun around behind the remainder of the principals who stared blankly into space – it felt that momentarily, Kosky had run out of ideas. Karolina Gumos (la Muse), Uwe Schönbeck (Hoffmann 1). 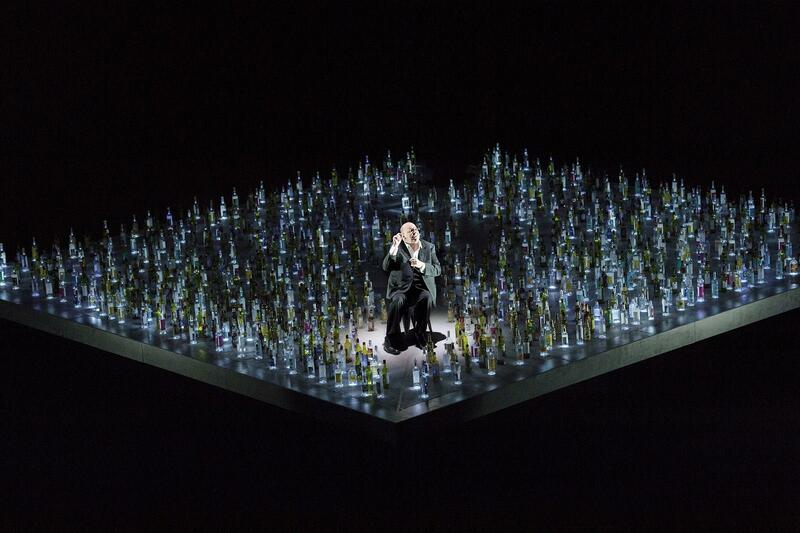 Otherwise where Kosky really distinguishes himself is not only does he have the vibrant imagination to create striking stage pictures but he also has the technical ability to transform those images from his head to the stage. He proved it in last year’s Moses und Aron in this same theatre where he succeeded in getting scores of people to execute complex movements unanimously. Tonight confirmed Kosky as an outstanding theatrical technician. A large diamond-shaped hydraulic platform formed the centre of the set. During the Antonia act, it was used to create deeply haunting, constantly-changing images through intelligent use of lighting (Diego Leetz) and the placing of performers on the set. There were the usual things that we have come to expect from Kosky – men in dresses, characters appearing from underneath other characters’ skirts – yet whereas in the past I have found Kosky to produce great images but less than cogent theatrical arguments this, in common with his most recent work, has demonstrated that he can indeed do both. 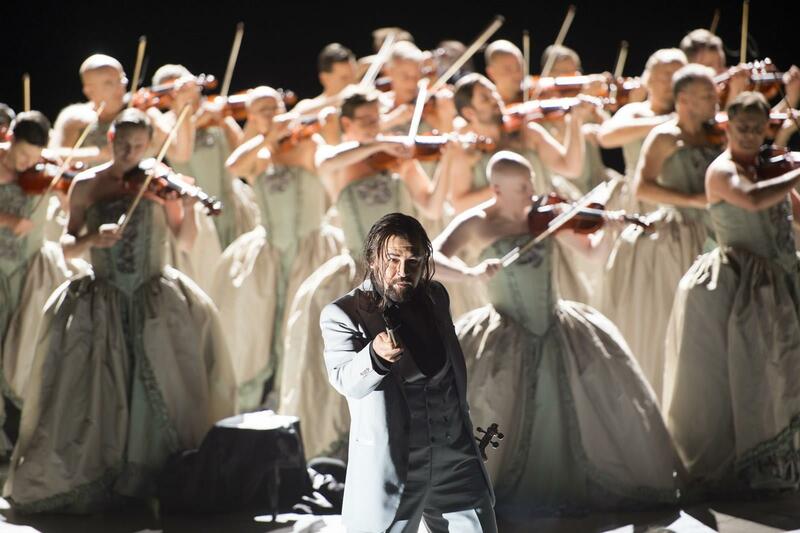 The most striking aspect of the musical performance was that – with one exception – the diction was remarkably good, especially given that there were no francophone singers in the cast. Indeed, Dominik Köninger’s Hoffmann 2 relished the language in the most remarkable way. He coloured the words so beautifully, his handsome baritone showing no strain despite the very high tessitura. The voice is exceptionally well placed, a bright and forward sound, and his singing of that beautiful romance ‘ah vivre deux, n’avoir qu’une même espérance’ was ardent and wonderfully phrased. Köninger’s Hoffmann was something very special and I very much hope that he will sing more French music in the future – his high baritone is ideal for Pelléas for example and he shows genuine affinity for the language. Alexander Lewis as Hoffmann 3 I’m afraid was less successful for me. His diction was sadly not as clear as his cast-mates – the diphthongs were inconsistent – and his handsome lyric tenor sounded pushed well beyond its natural limits. He certainly has stage presence and has solid musical instincts however. Karolina Gumos was an excellent Muse. Her sunny mezzo has real personality and her diction was impeccable. The voice has good resonance and the legato is even. She even made full use of the variety of colours in her voice to provide a different vocal personality while singing the role of Antonia’s mother. Dimitry Ivashchenko was a massive presence in his roles. Again, he made much of the words and pointed them to create a character that was both witty and threatening. His big number ‘dans les rôles d’amoureux langoureux’ was sung with even tone and genuine spirit. Nicole Chevalier took on the enormous challenge of the triple roles of Olympia, Antonia and Giulietta and more than rose to it. Perhaps ultimately she is one of nature’s Olympias – the voice sits quite high and she rose effortlessly above the stave adding quite a few extra acuti throughout the evening. Certainly, as Antonia it sounded that she was perhaps overly widening the voice to cut through the texture and yet she succeeded with very little sense of a voice being pushed beyond its natural limits. The coloratura was accurately deployed and she made a respectable stab at a trill. Hers is a full-bodied, creamy soprano that is very easy to listen to. She also coped remarkably well with having to sing while being spun around inn a box on wheels and having to do high pitched screechy noises in the middle of singing ‘les oiseaux dans la charmille’. The remaining roles were sung to the high standards that one expects from this house. Daniel Huppert is a new name to me and one I hope I will see again. He led a reading that genuinely lived. Tempi throughout the entire evening felt absolutely right – always vital yet never any sense of dragging. The orchestra played well for him with a few momentary passages of uncertain intonation in the strings not leaving any lasting impression. The chorus also sang with good blend, solid intonation and completely threw themselves into everything Kosky asked of them. Tonight was clearly the work of an imaginative director who knows not only how to create striking stage pictures and a coherent narrative but also manages to gain fully-committed performances from his cast. What really distinguished this performance was the fact that the diction from almost all the cast was so clear and consequently it made the evening live even more. This is a vital and intelligent piece of music-theatre. I wouldn’t say that it totally convinces but it definitely comes close. Fortunately, the Komische Oper has scheduled quite a few performances for next season. If anything shows this fabulous company at its best, it’s this.